Faith Of The Faithfull Probably, one of the greatest identities and definitions of faith, this book stops at nothing and yields for no doubt. 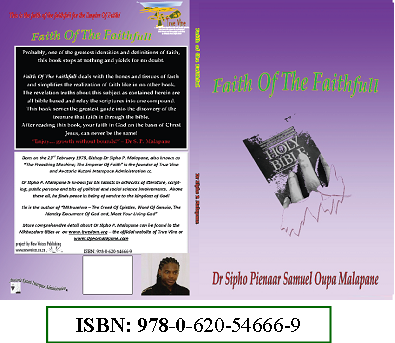 Faith Of The Faithfull deals with the bones and tissues of faith and simplifies the realization of faith like in no other book. The revelation truths about this subject as contained herein are all bible based and relay the scriptures into one compound. This book serves the greatest guide into the discovery of the treasure that faith is through the bible. After reading this book, your faith in God on the basis of Christ Jesus, can never be the same!